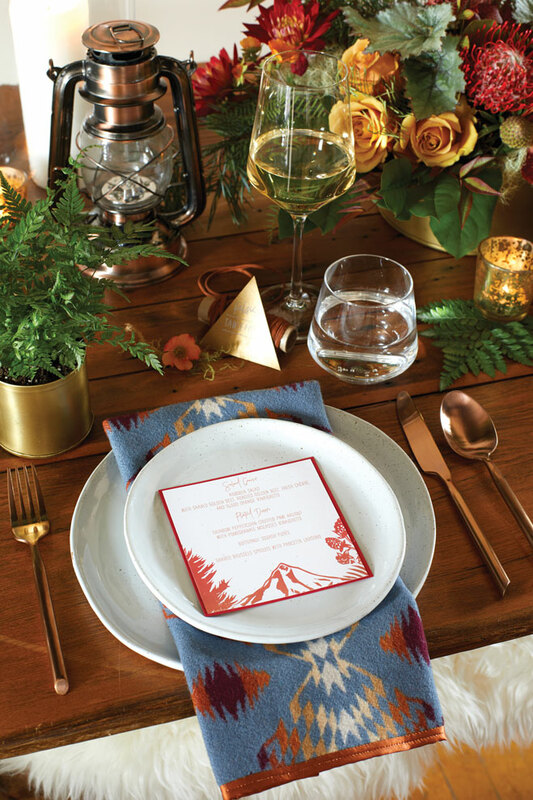 A rich color scheme of deep reds and powder blues sets a classic Oregon tableau, while bronze and gold metallic accents amp up the glam factor. 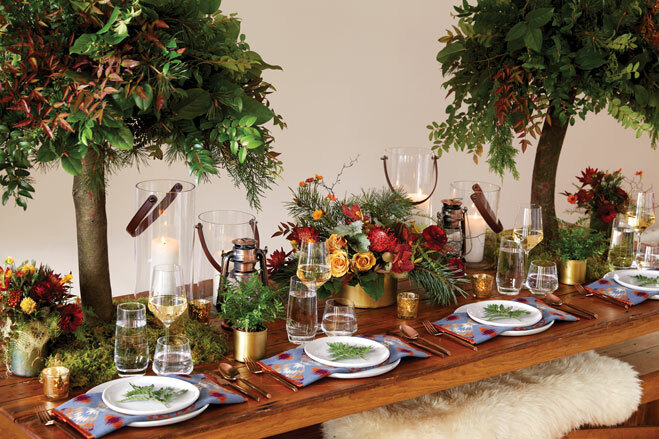 Farm table, salad plates, flatware, benches and sheepskin bench throw, all from Something Borrowed. Dinner plates and footed rocks drink glasses from Crate & Barrel. Pendleton Woolen Mills fabric napkins from Mountain Fiber Designs. Water glasses from The Party Place. Floral centerpieces and plants by Bella Bloom Florals. Candle lanterns from Adornment Events. 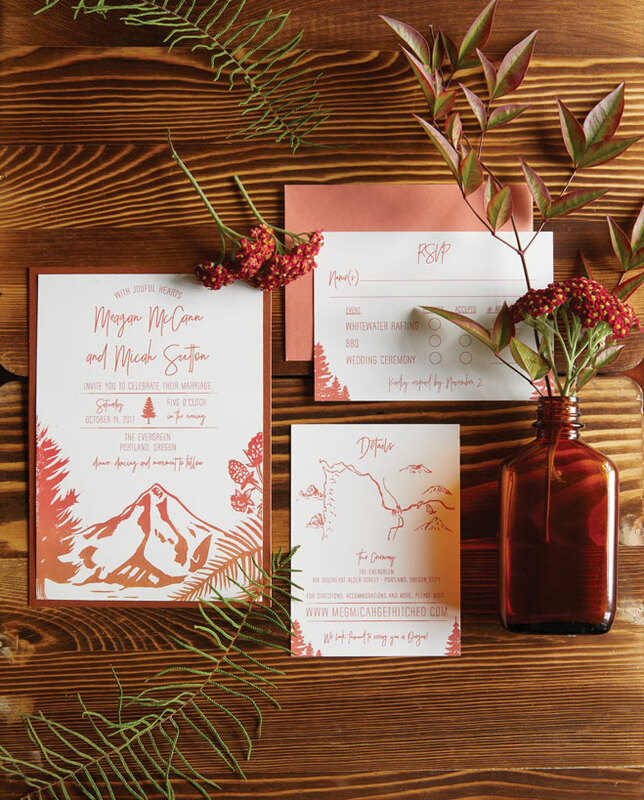 Handcrafted invitation suite features a woodblock print of Mount Hood and a hand-drawn map by Sunny Sisson of Hood River’s Puddle Jumpin’ Cards. Florals by Bella Bloom Florals. Vintage glass bottles from Adornment Events. 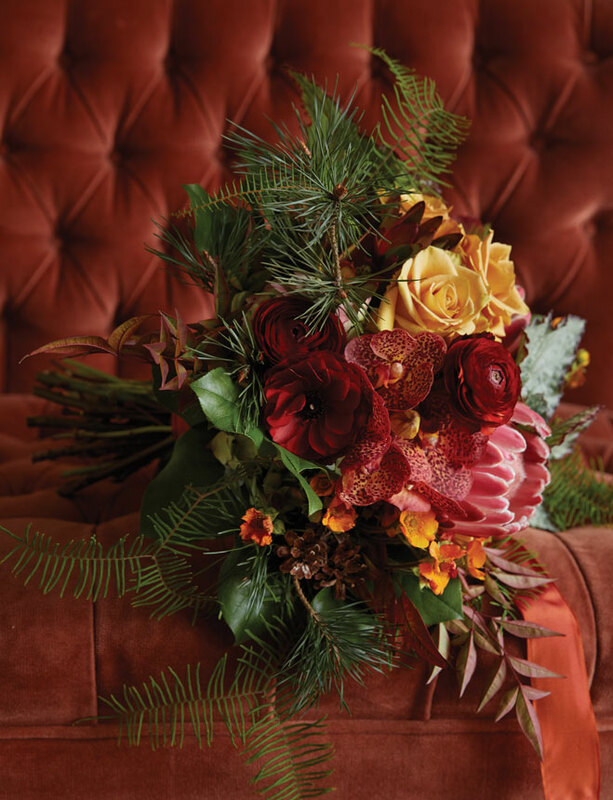 Combine classic Oregon roses, pine boughs and fern fronds with non-native blooms, such as orchids and protea, for a pleasing mixture of color and textures. Bouquet by Bella Bloom Florals. Orange settee from Something Borrowed. Sip on a signature drink by Portland drink caterer White Pepper, whose Tillikum Tipple blends toasted-orange-infused Bull Run bourbon, pinecone bud syrup, cedar and aromatic bitters, garnished with an browned orange slice and a cedar swizzle. 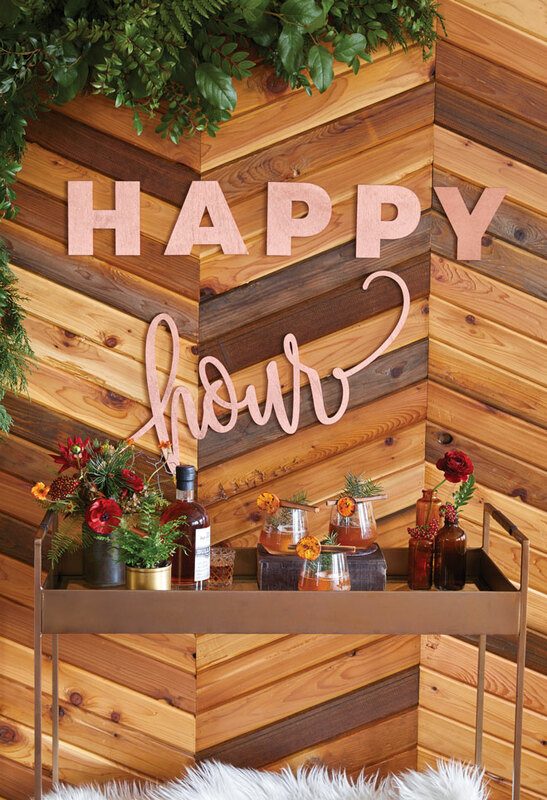 Happy-hour signage, bar cart and vintage glass bottles from Adornment Events. Chevron wood wall from Something Borrowed. Double old-fashioned glass from Crate & Barrel. Florals by Bella Bloom Florals. Opposite Page: Refined versions of camping essentials, such as lanterns and cozy wool blankets, bring the feeling of Northwest’s great outdoors inside. Pendleton Woolen Mills fabric napkins from Mountain Fiber Designs. Dinner plates from Crate & Barrel. Water glasses from The Party Place. Floral centerpiece, votive holders and potted ferns from Bella Bloom Florals. Lanterns from Adornment Events. Table numbers and menu by Puddle Jumpin’ Cards. Table and flatware from Something Borrowed. 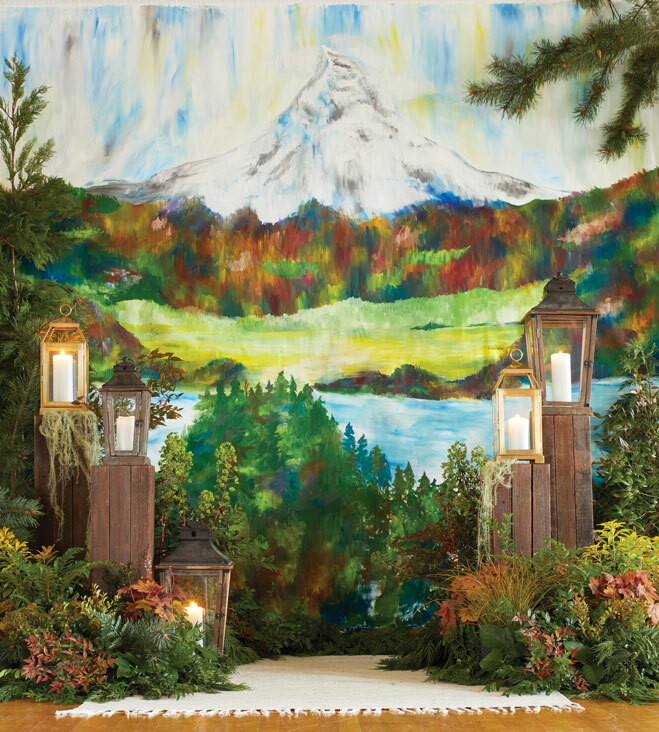 For bringing the Oregon-style wow factor, what could be more iconic than an evergreen-festooned altar (or photo opp station) and a painted backdrop featuring Mount Hood? Hand-painted backdrop by Brittany Hampton of Letters and Dust. Florals by Bella Bloom Florals. Lanterns and columns from Something Borrowed. Opposite Page: Devil’s Food Catering cooked up a three-course meal of Oregon favorites, including cider-glazed pork belly on grilled polenta cakes, salmon lox with chive crème fraîche inside salt-roasted baby potatoes, peppercorn-crusted Pacific Northwest halibut on a butternut squash purée and shaved Brussels sprouts. Pendleton Woolen Mills fabric napkins from Mountain Fiber Designs. 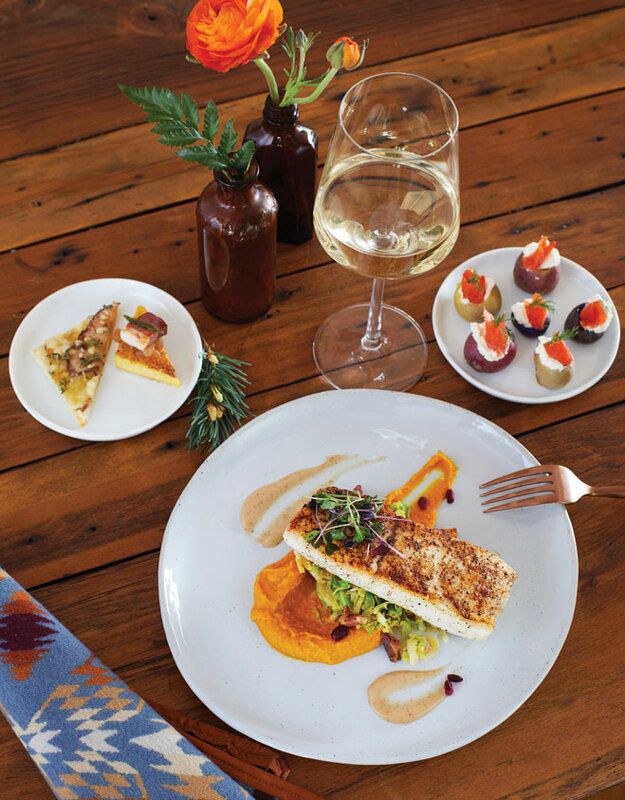 Dinner plates from Crate & Barrel. Table and flatware from Something Borrowed. Vintage glass bottles from Adornment Events. Although the cookies, cupcakes, tartlettes, macarons, pie, brownies and cake are enough to encourage gawking, guests might find themselves lingering over the creative artistry on display at this dessert table by the Hungry Hero in Sherwood. Handpainted details on the macarons and the cake’s decorative elements call to mind iconic Pendelton blanket colors and designs. 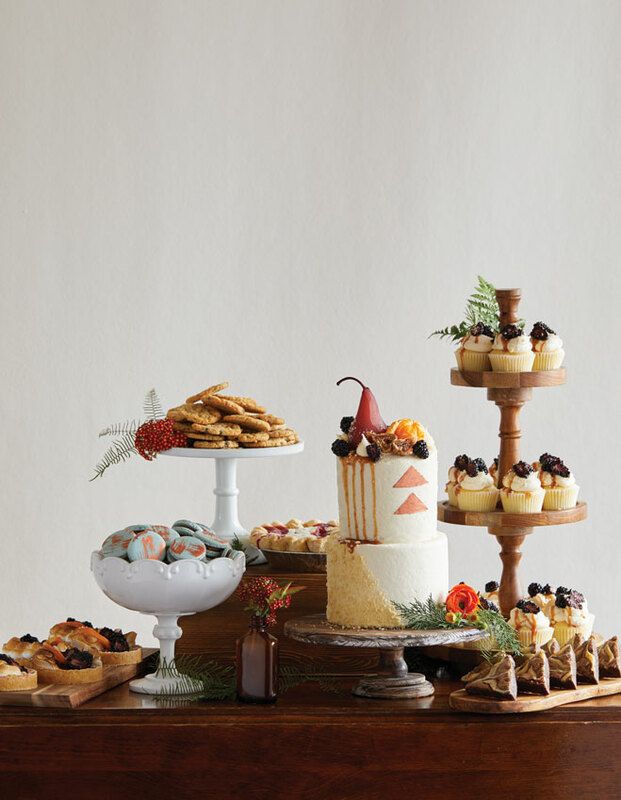 Cake stands and flat wood platter from Adornment Events. Florals by Bella Bloom Florals. 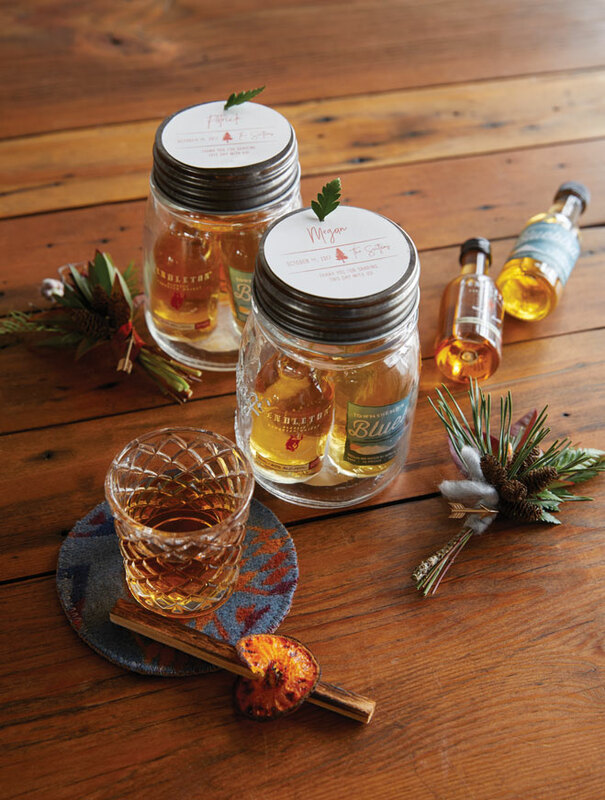 Carissa Smith, owner of Adornment Events, dreamed up the Oregon version of a “bar in a jar” as a token of appreciation for guests featuring travel-size liquor bottles from local spirit makers, such as Portland’s Bull Run Distilling Co. Double old-fashioned glass from Crate & Barrel. Boutonnière floral pieces by Bella Bloom Florals. Farm table from Something Borrowed. When it was time to shop for her wedding gown, Danielle Crough took a walk down memory lane before she walked down the aisle.